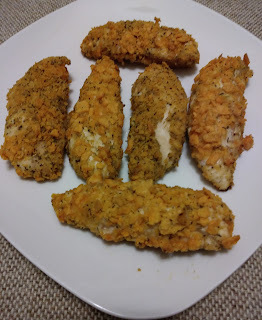 Season both side of chicken tenders with salt, pepper, garlic powder and drizzle olive oil on chicken. Cut a piece of tin foil to fit a cooking sheet. Lightly spray with non stick cooking spray. Set aside. Preheat oven to 375. Crush the Cheez It on a piece of tin foil, add italian seasoning, mix well. Take the chicken tenders and coated with crushed Cheez It's and place on sheet pan. Once all chicken tenders are coated, lightly spray with cooking spray. And place in oven. Bake 10 minutes and turn over, spray lightly with cooking spray. Cook until chicken is no longer pink. How clever using cheeze-its coating! I know it's a great flavor and a littl' crunch!